Some letterpress printed calendars still available! You know you want one. 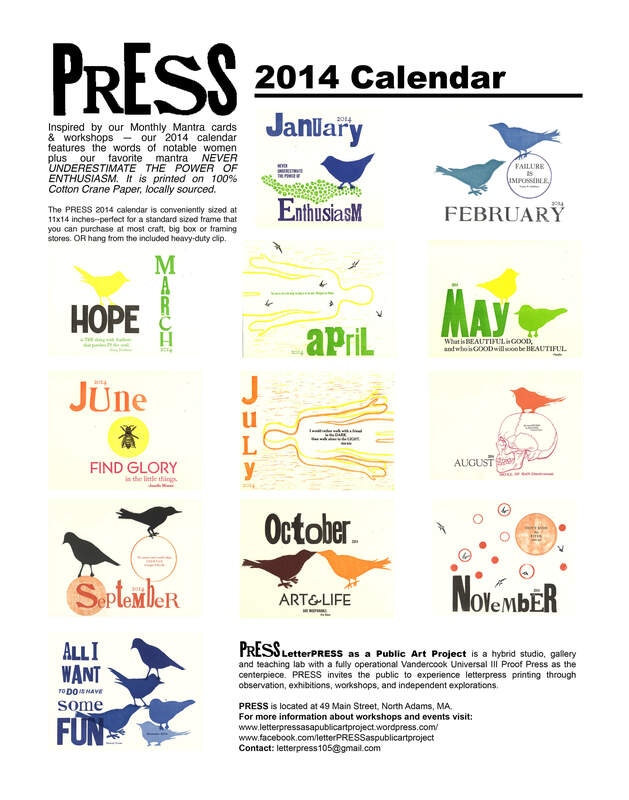 The PRESS 2014 Calendar. Get inspired every month with our Mantra Calendar. Every month was printed at PRESS gallery on our infamous Vandercook letterpress, on 100% cotton paper locally made by Crane Paper and includes quotes from Susan B. Anthony, Helen Keller, Emily Dickinson, VIrginia Wolfe, and more. Every month will contain the usual PRESS charm! $50+tax for pick-up at PRESS, $60 for shipping and handing (includes tax). For multiple calendar shipments, add only $55 for each extra calendar. Tags: 2014 calendar, letterpress calendar. Bookmark the permalink.